The Consolidated Appropriations Act, 2018, which includes a sentence authorizing the Regional Center program through September 30, 2018 has been passed by Congress and signed by President Obama. Now it will become law, and the EB-5 status quo can continue for another few short months. If the alternative draft EB-5 legislation recently under discussion had been enacted instead, we’d now have a higher minimum investment amount for all EB-5 investors, more guarded and complicated targeted employment area parameters, limitations on foreign ownership of EB-5 enterprises, complicated fees and requirements, solid new integrity measures and a heavier paperwork burden on regional centers and USCIS. As it is, nothing in EB-5 has changed for now but Investors are advised to move quickly and file their applications urgently to take advantage of this short extension. 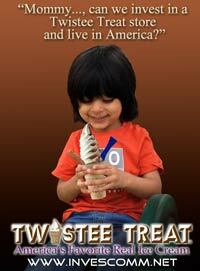 Twistee Treat now has several USCIS Approvals and investors are enjoying their Green Card status. Documents are available for viewing on request. 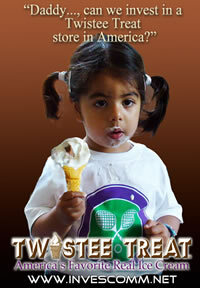 Intram Investments is the parent company of Twistee Treat USA based in Orlando Florida with many successful Real Estate and Commercial investment projects. Watch a video of their impressive operation here. * Are you working with clients who are looking for sound investment opportunites in business or property? * Do you have clients that are seeking American citizenship? CONTACT US TO FIND OUT ABOUT OUR PARTNER SCHEMES! Find out more about our exciting investment opportunities shown at the summit. The foregoing information is not an offer to sell, or an invitation to subscribe for, or the solicitation of an offer to buy or subscribe for securities of any company. The information presented is intended only to present general information to gauge the interest of qualified individuals in participating in a business relationship as described. An offer to sell, an invitation to subscribe for, or the solicitation of an offer to buy or subscribe for any security will only be made in formal documents to be provided to qualified potential investors.